Anxiety, Depression and Stress are all feelings that surge during the busy holiday months. Working with Dr Guada on updating a cluttered, dated web presence was nothing short of soothing. After meeting Dr. Guada months ago during the launch phase of her business, we crossed paths again when the need for Search Engine Optimization (SEO) was raised. 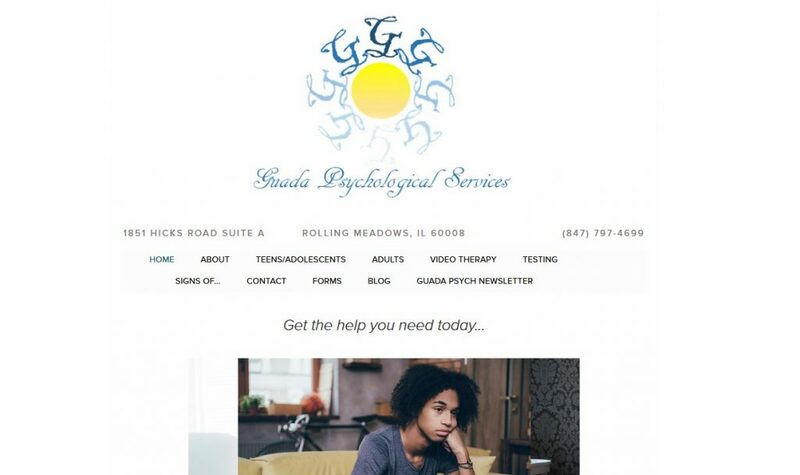 Noting that there isn’t much we can do with outdated websites, the decision was made to create a fresh new website for Guada Psychological Services to display their service offering. Since we were making updates, we decided that now would be the time for a new logo and some graphic design to aid in the refresh. Creating a clear vision of the services offered by Guada Psychological Services was part of the refresh, allowing our content team to dig deep into the focus of how and why Dr Guada became a psychologist. Starting with her existing logo, incorporating the G and the Sun imagery, Dr. Guada shared her desire to have a visual representation of what her business is. There was discussion around how the logo would be used, primarily focusing on community investment, philanthropy and event sponsorship. The color scheme was chosen and there was some back and forth about whether to incorporate an actual brain design or the selected overlapping ovals. The sun remained an integral part as well as the text highlighting the practice name. We were able to update the site, incorporating the new logo and color scheme, as well as refresh the copy within the confines of the launch of the SEO campaign. Dr. Guada also released a video incorporated into the home page at the same time as the site launch. We are working with Guada Psychological Services to increase their ranking for a number of terms as well as building an online community via social media. If you don’t already like Guada Psychological Services on their social media pages at Facebook, LinkedIn, Twitter and Google+ I encourage you to do so now. We’ll be sharing important information about seasonal stress as well as coping mechanisms to ease anxiety, stress and depression in times of need. Whether you have an existing need and/or will in the futurte, it’s important to note that Guada Psychological Services includes youth screening, adult and adolescent therapy as well as Video Therapy in their suite of services. When looking for a Therapist Nearby, Remember Guada Psychological Services in Elk Grove Village.